Ask to see a copy of the veterinarian's license. It should be posted in the public area of the clinic. Ask for a tour of the clinic; if you are refused, take your animal elsewhere. The clinic should be clean and orderly. Animals should be housed comfortably in clean cages or kennels. Ask friends and family for referrals. 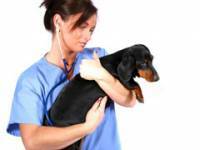 Recommendations for trusted veterinarians can be invaluable. Observe your animal. Is your companion hand shy around the veterinarian, as though expecting a slap or a blow? Does he or she cower or urinate when the veterinarian enters the room? Observe the veterinarian. Is he or she nervous or irritable? Does he or she go into the back room for even simple procedures? Are the technicians rough when handling your animal? Always exercise your right to be with your animal at all times. If the veterinarian or technicians want to take your companion to another room, insist on going along. If they refuse, don't hesitate-take your animal and leave. If your animal must stay overnight (and always question this), make sure someone is going to be there to monitor him or her at all times. If not, take your animal home where there will be constant supervision. Ask questions. A good veterinarian should explain what he or she is doing-and why-at all times. For any major medical concerns, seek a second or third opinion. You are entitled to copies of your animal companion's medical records and x-rays. If you believe that an animal has been mistreated, take him or her to another veterinarian for a thorough examination. If you have evidence of malpractice, you can file a complaint with the veterinary licensing board in your area. Contact local law-enforcement officials if you witness outright cruelty. Always keep records and take photographs. You can improve the lives of dogs and cats suffering from cruelty and neglect.